So he went and found one of the citizens of that country, Paul, one of his master’s old friends, who led him to faith in Christ and into ministry among the gentiles, who some people called “pig-farmers” and refused to eat with. Once Onesimus had finally come to himself, Paul urged him to return and be reconciled with Philemon. He said, “I will arise and go to my master, and say to him, ‘Master, I have sinned against heaven and before you. I know I’m not worthy, but would you take me back as one of your slaves?’” So he arose and went to his master. That was when Onesimus stretched out a small parchment scroll to his master. Philemon broke the seal and quickly scanned the letter. It was from an old friend. Paul, a prisoner for Christ Jesus. To Philemon our beloved fellow worker. I thank my God always when I remember you in my prayers, because I hear of your love and of the faith that you have toward the Lord Jesus and for all the saints, and I pray that the sharing of your faith may become effective for the full knowledge of every good thing that is in us for the sake of Christ. For I have much joy and comfort from your love, my brother, because the hearts of the saints have been refreshed through you. Accordingly, though I am bold enough in Christ to command you to do what is required, yet for love's sake I prefer to appeal to you--I, Paul, an old man and now a prisoner also for Christ Jesus--I appeal to you for my child, Onesimus, whose father I became in my imprisonment. (Formerly he was useless to you, but now he is indeed useful to you and to me.) I am sending him back to you, sending my very heart. 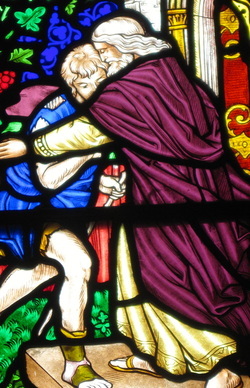 I would have been glad to keep him with me, in order that he might serve me on your behalf during my imprisonment for the gospel, but I preferred to do nothing without your consent in order that your goodness might not be by compulsion but of your own accord. For this perhaps is why he was parted from you for a while, that you might have him back forever, no longer as a slave but more than a slave, as a beloved brother--especially to me, but how much more to you, both in the flesh and in the Lord. So if you consider me your partner, receive him as you would receive me. If he has wronged you at all, or owes you anything, charge it to my account. I, Paul, write this with my own hand: I will repay it--to say nothing of your owing me even your own self. Yes, brother, I want some benefit from you in the Lord. Refresh my heart in Christ. Confident of your obedience, I write to you, knowing that you will do even more than I say. At the same time, prepare a guest room for me, for I am hoping that through your prayers I will be graciously given to you. The grace of the Lord Jesus Christ be with your spirit. Philemon looked up and said quietly to some slaves, “Bring your…, I mean my sl…, I mean my brother, some clothes, some nice clothes, and put them on him, and put a ring on his finger, and put new sandals on his feet. And bring a fattened calf and kill it, and let us eat and celebrate. For this my…brother was dead, and is alive again; he was lost, and is found.” Then he turned to Onesimus and said, “Brother Onesimus, you are welcome to stay with me always, and let me refresh your heart. But for now let us celebrate and be glad. You were dead to me, useless, but now you are alive, useful; you were lost, and now you are found." And they all began to celebrate.